Check the latest health information on the links above & below. Take the FLU IQ Quiz! Are you at risk for Diabetes? Check yourself with this tool! Enter your age and gender in the boxes at left and click "Get Started" to view health recommendations for you. These are important ways you can stay healthy. Talk with your physician about which recommendations are right for you. 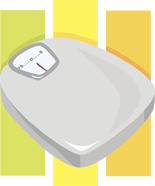 Click here for important ways you can keep a healthy weight. Talk with your physician about which recommendations are right for you. Click here for tips on checking your Cholesterol. Click here for tips on keeping your Heart Healthy. Click here for talking with your doctor about Aspirin. Click here for talking with your doctor about Abdominal Aoritc Aneurysms. Click here for tips on checking your Blood Pressure. Washing your hands is the single most important thing that you can do to prevent the spread of infection. Having small open scratches or cuts on your hand could lead to infection entering your body if not kept clean. So wash your hands often. We harbor many kinds of serious germs on our hands and for many of us, having contact with many people over the course of a day can expose and spread many types of cold, flu, and infectious germs. Anywhere you come in contact with the masses of the people, there is an unknown source of “cleanliness” and all of us are equally exposed to infectious diseases and sickness. A recent study was completed that only 3 in 10 people washed their hands after using the toilet, making inside doorknobs of bathrooms and other rooms potentially the most dangerous thing. When in someone’s home where there is sickness or illness you should be cautious of using the toilet facilities. NEVER wash your hands using a patient or sick persons facilities, towels or soap. Using liquid hand sanitizers or disposable hand wipes are a better alternative when soap and water are not available to disinfect your hands. Be sure that these materials provide germicidal activity and use them often. Dry with paper towels and dispose in the waste container. 1. Use a hand-washing sink. 2. Use hot running water. 3. Use antibacterial soap. Scrub hands and forearms aggressively for at least 20 seconds. 4. Use paper towels to dry hands, turn off water and open the door. Air dry machines are not effective for drying your hands completely. 5. Place used paper towels into the trash can before leaving. Many hand sanitizing products contain high levels of alcohol (60%+) which can cause a serious drying effect, and may also require the use of a moisturizer. Consider a multipurpose, low alcohol product. It is important to remember that using hand sanitizers only sanitize (kills germs) and does not clean the hands. If you work or have much contact with the public and need to wash your hands often, make sure you clean your hands with soap and water after every 4-5 applications of sanitizer. If tap water is not available, carry or have a bottle of bought water to use. Be sure to use antibacterial soap and dry your hands with paper towels. Be Active Your Way...Check this out! Get in shape...start walking...walk with BMS! Our employees are walking for health and you can too! See how many miles or steps you walk in a month! 1) Get a pedometer and clip it to your waistband and it will count all the number of steps you walk, even if you're just going to the fridge for food! 2) Track how many steps you take to walk the dog, do housework, walk around the town. It's amazing to see how many steps you take and try to increase those steps each day. Get out and enjoy the fresh air...if it's raining or you can't get out...walk around the inside of your house. 3) Walking Log - Click here to download PDF and print out to track how many miles/steps you walk in a day. Don't have a pedometer? Call BMS at 330-545-6700! OK...your Kettlebell classes are over, now what?! Keep motivated with your Kettlebell workouts by visiting these websites for more exercises. Have an iPhone or Android device...check out the Kettlebell apps! Keep checking back...we'll add additional resources as available. The content provided on these websites is NOT intended as a substitute for professional medical advice, diagnosis, or treatment. Always seek the advice of your physician or other qualified health providers with any questions you may have regarding a medical condition or starting any exercise program. If you think you may have a medical emergency, call your doctor or 911 immediately. BMS does not recommend or endorse any specific tests, physicians, products, procedures, opinions, or other information that may be mentioned on these websites. 1) Make a date...set up a time and day and try to exercise at that same time/day whenever you can. 2) Send yourself a reminder...text, email, or write yourself a sticky note. 3) Start with the smallest increment and the easiest exercise...try 10-20 minutes of exercising at first, then build up from their. Or, do several "mini-workouts" during the day to equal your total time allotment. 4) Progress later...once your body is accustom to your new routine and exercise, then slowly, increase your exercise both in intensity and time. 5) Make your exercise a pleasurable one. If you walk, enjoy the scenery or listen to music. Exercise doesn't have to cost money or have equiopment. Dance, ride a bike, swim, visit a playground, do yoga or tai chi, go bowling, visit a "green" gym or work in the garden. Choose an activity that is fun for you. 6) Keep your exercise wardrobe and gear handy. Make it easy to change clothes and make it easy to start exercising for the day. 7) Mix up your routine, just a little, to keep it interesting. If you walk, go a different direction every day. 8) Take a day off. If you are exercising consistently for 6 days, take the 7th day off as a reward and to let your body recover. 9) Other than your "day-off", do not skip a day...keep it up. 10) Don't procrastinate...just get up, start and go! Studies show that exercising just 15 minutes a day can reduce your risk of cancer and add an average of 3 years to one's life. Click here to read more. 1) Put your favorite walking shoes near the door...they will remind you that you need to get walking. 2) If you have a destination in mind it will make exercising more beneficial... like walking to the post office, bank or store. 3) Make a date with yourself...add your walk time on the calendar and do it consistently. 4) Enlist a friend to walk with you...you will usually walk further and have more fun. 5) Find an article of clothing that you formerly fit into and keep it hanging where you will see it to motivate you to get back to that size. Try little steps first, select a garment that is no more than 10% less than your current size. 6) While waiting for your air travel flight, bus, or other public transporation, walk around the terminal or bus stop for a quick, brisk walk. 7) When running an errand, walk or ride a bike instead of using your car. 8) While watching TV, during commercials, walk in place, climb up and down a set of stairs, or walk around the house until the commercial is over. 9) Park farther away rather than trying to get a parking spot close to the door. You'll benefit from the exercise and avoid congested traffic. 10) Instead of leaving your shopping cart in the parking lot, return it to inside the store. 11) Instead of using the drive-thru at the bank or restaurant, walk inside to do your banking or place your order. 1) Walking at a brisk pace is really good for you. Especially if you enjoy your surroundings and breathing in fresh air. Make it a point to walk and spend more time with a friend or family member. Walk with your children and find out what they did in school today. 2) A diabetes prevention program for people who are overweight showed that walking 150 minutes a week can reduce the risk of developing diabetes by nearly 60 percent. 8) Walkers have less incidence of cancer, heart disease, stroke, diabetes and other killer diseases. They live longer and get mental health and spiritual benefits. ** Excerpts taken from The Mayo Clinic: Walking: Trim your waistline, improve your health. Dance to a DVD or Video. Laugh and play with your kids. Laugh and play with your pets. 1) Be Realistic: Fit your activity to your lifestyle. If you don't belong to a gym or hate running, try walking around your neighborhood instead. 2) Start Slow: Small changes can make a big difference. Choose one item to start, like walking more...and do it. When you feel comfortable that it fits in your lifestyle, add a second...like drinking more water instead of soda, and so on. 3) Be Consistent: Try to keep a regular schedule. If you decide to walk, walk every day and make it a habit. 4) Stick With It: It takes about 21 days for a behavior to become a habit, so if you start walking, stay with it for 21 days. 5) Make a Commitment: Usually, putting a promise in writing helps us to commit to it. Write down the reasons for wanting this commitment, whether it is to exercise more, drink more water, eat healthier snacks, etc. and all the positive reasons to substantiate it. Tell your friends and family about your commitment so they can support your effort. 6) Be Flexible: If you have committed to walking more every day and want to walk in the evening, be flexible, in case your schedule doesn't allow it. On the day of the conflict, walk in the morning or at lunchtime. 7) Forget About Fads: If you read about some new diet or exercise equipment, make sure it is what you want to do or spend the money on and that it validates what it is supposed to do before you commit to it. You don't have to spend money to walk around the block and it could have the same benefits as some new fad. 8) Plan for Activity: Make fitness a primary activity in your busy schedule. Plan on it. 9) Make a list of Options: List your alternative options so your fitness or diet plan does not fail. If it's raining and you can't walk outside, make an alternative list like going and walking in the mall. If your diet plan is to drink more water, list some other alternatives, like flavored water, to change it up. 10) Be Creative: If you decide to walk more everyday, choose different ways that you can keep it fresh and different so you will be more mindful to complete your goal. Walk with a friend, walk your pet, walk at the mall, take a nature walk, etc. 11) Forgive Yourself: If you mess up and miss your exercise or diet schedule, just start again. Don't fret or make excuses, start walking or start that diet again and keep going. 12) Reward Yourself: If you've stuck with your diet or exercise program, even for a day, congratulate yourself for starting! And, congratulate yourself on each milestone, each day, each week, each month, etc. that you've kept up with your plan you deserve a reward. Try to reward yourself with something that won't jeopardize your results, ie: if you are changing your diet lifestyle, try not to celebrate with a big piece of cake and ice cream...how about a relaxing bath instead. What's growing in your lunchbox! Are you consuming too much sodium? Take this quiz! Get healthier...eat wiser...eat better with BMS! Our employees are eating better for health and you can too! Eating habits, physical activity and your general lifestyle all have a great impact on your well being. And, being aware of your habits is essential to determine how healthy you are. We at BMS are encouraging everyone to take this simple quiz to become more aware of your health habits. Answering honestly to these questions will only help YOU! Answer the following questions and become more aware of your health habits! 1) Do you eat three well balanced meals a day? 2) Do you think you have a preoccupation with food and weight; A distorted body image; or Under eating or overeating under stress? Do you think you might have an eating disorder? 3) When you go out to eat, do you select a restaurant that serves healthy options? 4) Under stressful situations, especially for students during exams, do you deal with stress by eating or do you pre-plan activities, be more physically active and perform relaxation techniques to control the level of stress? 5) Do you limit the amount of alcohol and caffeine that you consume? 6) When you have a cold or flu, do you get plenty of rest and drink plenty of fluids? Do you know when it is time to go see a doctor...when in doubt...call your physician? 7) Do you choose air popped popcorn, fresh fruit and vegetables when you snack? 8) Do you do aerobic act ivies three or more times per week? Do you do resistance training two or more times per week? 9) Do you make attempts to decrease the amount of saturated and trans fat that you consume? Do you try to increase the amount of fiber in your diet? 10) Do you avoid popular diet programs, such as low-carb diets, powdered milkshake formulas, and diet pills? 11) Have you been seen by a medical professional for iron deficiency anemia? 12) Do you limit your intake of soft drinks or caffeinated beverages? Do you drink 10-13 cups of fluid daily, preferably water? 13) Do you select foods that are high in calcium on a daily basis? 14) Do you know the difference between complex and simple carbohydrates? Do you choose whole grain foods? 15) Does your diet include the daily recommended servings from the My Plate Food Guide? 1) Are you actually hungry? Or, are you just eating because of other outside influences, like being tired or lonely or even happy, or watching tv. If you are not hungry, don't eat until you are, it's that simple. 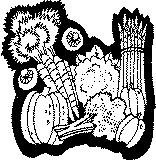 If you must eat something, try a serving of raw vegetables or fruit to hold you until your next meal. 2) Are you thirsty rather than hungry? It is easy to confuse the signals between hunger and thirst. Try drinking a glass of water first. If you are still hungry...then eat a healthy snack to curb your appetite. 3) Are your portion sizes too big? Most restaurants and fast food chains use the "super size" snack that are loaded with extra fat, sugar and empty calories. Start with a small size or share with a friend. Also, for snacks at home, transfer the big pretzel bag into individual sandwich bag single serving sizes. 4) Do you read the food labels? If you aren't reading the food labels you better start. What might look like a lean cuisine, may end up being 600+ calories. That's almost a third of a 2000 calorie diet from just 1 item. 5) How much snack are your eating? Pay attention to the quantity of snacks you consume. Are you eating while watching a 2 hour movie, and eating the whole time. Slow down on chewing and enjoy your snack, you'll eat less, your system will absorb the nutrients better. Or make individual serving sizes and be sure to have only your 1 serving. 6) How much protein are you getting from your snack? Most snacks are low in protein and high in sugar and fat. Better alternatives with protein are meat, dairy, nuts and soy products. They are better for you and keep your hunger satisfied longer. 7) Are you NUTS? A handful of nuts can satisfy your craving for something salty with a good nutrition value. 8) Eat your Vegetables! A great fast food snack is raw vegetables. Keep sliced vegetables in individual serving size sandwich bags for a quick on the go snack. Sliced carrots, celery, cauliflower, broccoli, oh my! 9) Eat your Fruit! Fresh, dried or canned fruit is a great treat any time of day. Make up single serving sizes or grab and orange or apple for a quick snack on the go. 10) Are you drinking your calories? Soft drinks have lots of sugar and excess calories. Try low-fat milk or flavored water instead. Here are some quick and easy ideas for you to make your own healthy snack. A balanced snack can make all the difference in how hungry you feel. Have one of these super snacks during your day and you'll get an extra boost of energy that will satisfy your hunger cravings! 1) Oatmeal with low-fat milk: Oatmeal is a great source of fiber and it only takes a minute to heat up in the microwave. 2) Low Fat Yogurt with Berries: Stir in fresh strawberries, blueberries or raspberries into some low fat vanilla yogurt. Experiment with different flavors of yogurt for even more flavor. 3) Nuts and Dried Fruit: Mix up your own trail mix of a handful of nuts with raisins, dried apricots or bananas or apples. Dried fruit has more concentration of sugar, so be mindful of the serving size. 4) Cheese and an Apple: Make an elegant snack of low-fat cheese with a sliced apple. Serve it up on a silver platter and serve with sparkling water in a champagne glass...prop your feet up and enjoy! Need an on the go snack, grab an apple and a low-fat string cheese in a wrapper. 5) Beef Jerky and Pea Pods: You can make home made beef jerky by very thinly slicing a lean cut of beef, marinate in soy sauce and place in a low oven to dry, or use a dehydrator. Pair it up with edamame, sugar snap peas, or pea pods. Put it in a chinese carry out container for the full effect of eating chinese take out. 6) Turkey Sandwich: Whole grain bread and a slice of turkey, lettuce, tomato and mustard! Low-fat, lean and full of protein. 7) Banana Snack: Slice a banana and spread with smooth or chunky peanut butter. Place between two pieces of whole grain bread for a wholesome sandwich. 8) Cottage Cheese and Fruit: An old favorite, 1/2 cup of low-fat cottage cheese with juice packed fruit. Great with fresh or canned pineapple, peaches or pears. 9) Tomato and Cheese Kabobs: Cut up a mozzarella or low-fat cheese stick and skewer on a kabob alternating with cherry tomatoes! 10) A Classic Salad: Use your favorite salad greens and sprinkle with a tablespoon of sunflower seeds, dress lightly with vinegar and olive oil. 11) Cheese Tortilla: Use your favorite cheese and roll up with a whole wheat tortilla, plain, spinach or tomato. 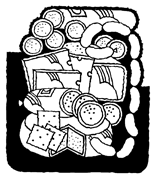 11) Microwave Soup: Check the instant soup isle in the grocery for your favorite bean, or bean and rice combo. Make some easy chicken broth with bouillon in the microwave and add some cooked noodles and fresh parsley. These make a quick and hearty light soup to keep you warm and cozy. The key to healthy snacking is the effort on your part to make wise food choices. MINIMIZE snacking on candy, chips and soda and MAXIMIZE snacks low in fat, low in sodium, and low in added sugar! 1) Fresh Fruit and Vegetables: Fresh fruit is a great source of fiber and complex carbohydrates and are packed with vitamins and minerals. 2) Yogurt and Cottage Cheese: A great source of protein, vitamins, calcium and other minerals. Look at the labels and lean toward 1 percent low-fat or fat-free. 3) Raisins, Whole Grain Crackers, High Fiber Cereal: All are nutritious snacks, but watch your portion control. 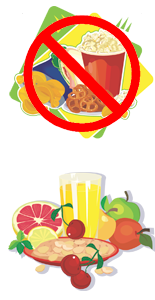 4) Snack Substitutes: Choose healthful choices rather than high-fat choices. Baked over fried usually has less fat. Air-popped popcorn is low in fat and calories and also a good source of fiber. Try a yogurt shake instead of one made with fat filled ice cream. 5) Don't Skip Meals: If you skip a meal, you will be hungrier the next with the temptation to eat more, eat faster, or choose less healthy, quick meals. 6) Eat in the Dining Room: Watching TV or talking on the phone while eating distracts you from eating the proper proportions. People have a tendency to overeat while performing another activity while eating. 7) Don't eat on a Break: Walk, Jog, or do exercises while on a break, instead of eating a cookie or pizza or eat an apple as a healthy alterative if you are having hunger signals. 8) Drink Water: Drinking water all throughout the day will help you feel full and less likely to grab that unhealthy snack. 9) Choose Healthy Snacks: Choose snacks low in fat, low added sugar, low in added sodium, and high in fiber, vitamins and minerals. Choose snacks that don't stick to your teeth and are low in added sugar. 10) Eat in Moderation: Eating in smaller portions, means eating less calories. Save part of a larger meal to eat later as a snack. What is High Blood Pressure - Hypertension? Diabetes is a group of metabolic diseases in which a person has high blood sugar, either because the body does not produce enough insulin, or because cells do not respond to the insulin that is produced. This high blood sugar produces the classical symptoms of frequent urination, increased thirst and increased hunger. Having sleep apnea can also bring on symptoms of Diabetes. Chronic nasal congestion that occurs is actually a symptom of chronic sinusitis. Chronic sinusitis treatment can be accomplished by first understanding the underlying cause of the condition. Significant congestion may interfere with sleep, cause snoring, and can be associated with sleep apnea. Heart disease or cardiovascular disease are the class of diseases that involve the heart or blood vessels - arteries and veins. While the term technically refers to any disease that affects the cardiovascular system, it is usually used to refer to those related to arteriosclerosis or arterial disease. These conditions usually have similar causes, mechanisms, and treatments. By the time that heart problems are detected, the underlying cause (arteriosclerosis) is usually quite advanced, having progressed for decades. There is therefore increased emphasis on preventing arteriosclerosis by modifying risk factors, such as healthy eating, exercise and avoidance of smoking. Having sleep apnea can increase your chances of having cardiovascular disease. Glaucoma is an eye disorder in which the optic nerve suffers damage, permanently damaging vision in the affected eye(s) and progressing to complete blindness if untreated. It is often, but not always, associated with increased pressure of the fluid in the eye. The term 'ocular hypertension' is used for cases having constantly raised intraocular pressure (IOP) without any associated optic nerve damage. Having sleep apnea can increase your chances of having glaucoma. Hypertension (HTN) or high blood pressure is a cardiac chronic medical condition in which the systemic arterial blood pressure is elevated. Hypertension is classified as either primary (essential) hypertension or secondary hypertension; About 90–95% of cases are categorized as "primary hypertension," which means high blood pressure with no obvious medical cause.The remaining 5–10% of cases (Secondary hypertension) are caused by other conditions that affect the kidneys, arteries, heart or endocrine system. Having sleep apnea can put you at risk for hypertension. Heart Failure: High blood pressure puts extra demand on the heart. Over time, the heart grows bigger to make up for the extra work and it eventually weakens. Heart failure occurs when the weakened heart can’t pump enough blood to meet the body’s needs. High blood pressure is the biggest predictor of heart failure. One study found that 90 percent of people with heart failure had high blood pressure. Heart attack: High blood pressure can damage the arteries that carry blood and oxygen to the heart muscle. If these vessels become narrowed and damaged, a blood clot can form and lead to a heart attack. Stroke: The biggest risk factor for stroke is high blood pressure. High blood pressure can damage arteries that supply blood to the brain. A clot can form and block the artery and prevent blood flow to the brain, causing a stroke. High blood pressure can also cause arteries in the brain to burst. This also results in another type of stroke called hemorrhagic or bleeding stroke. Kidney damage: High blood pressure can damage the arteries that supply the kidneys. This leads to kidney damage and kidney failure. This is especially dangerous because kidney damage raises blood pressure even more. Vision problems: High blood pressure can damage the blood vessels that supply the eye. The blood vessels can burst or bleed, causing blurry vision and blindness. Memory loss: High blood pressure can restrict blood flow to the brain. If too little blood reaches the brain, the brain cannot work well. One study found that this may lead to memory loss. Take all medications as prescribed - Never stop taking a medicine without talking to your doctor first. Blood pressure medication can cut your risk of heart failure and other complications in half. Reach or maintain a healthy weight - If you are overweight, lose weight. A weight loss of just 10 pounds can help lower blood pressure. Follow the Dietary Approaches to Stop Hypertension (DASH) diet - Studies show that the DASH diet helps control high blood pressure. The diet is rich in vegetables, fruit and low-fat dairy. Foods high in saturated and total fat and cholesterol are limited. Limit sodium (salt) intake - Eating a diet low in salt can help keep your blood pressure in check. Keep sodium intake to less than 2,400 mg per day. Get Active - Work up to 30 minutes of exercise most days of the week. Check with your doctor before you start or increase your level of exercise. Avoid Alcohol - Drinking too much or too often raises the risk for high blood pressure. Don't Smoke - If you do, quit. The "DASH" eating plan, is short for "Dietary Approaches to Stop Hypertension". If your first thought is that the DASH is bland and boring, think again. The DASH is as much about adding tasty, nutrient-rich foods as it is about limiting fats and sugars. Two large studies, both supported by the National Heart Lung and Blood Institute, have offered proof that DASH works. The first study looked at the effects on blood pressure of eating a varied, wholesome diet versus the typical American diet. Results showed that blood pressure could be lowered by eating combinations of healthy foods, such as fruits, vegetables and low-fat dairy products, as opposed to the typical American diet. Up your vegetable intake • Add a variety of veggies to lunch or dinnertime salads and soups, • Have cut-up veggies such as carrots, colored peppers, cucumbers, cherry tomatoes and celery for snacks, with a low-fat yogurt dip, • Increase vegetable portions of casseroles and stir-fries while decreasing meat portions, • Add beans/legumes to salads, soups and casseroles. Go Whole Grain • Choose whole-grain breads, cereals and pastas, • Instead of white rice or potatoes, experiment with brown rice, quinoa, barley and bulgur. Go Nutty • Sprinkle nuts into whole-grain cereal, yogurt or salads, • Add natural peanut or almond butter to whole-grain bread with sliced banana, • Snack on small amounts of nuts and dried fruit. Do it with Dairy • Use skim or low-fat milk in smoothies with fresh fruit and 100 percent juice, • Add skim or low-fat milk to coffee for lattes, • Choose low-fat yogurt for breakfast or snacks. • Use low-fat cheese on whole-grain bread, sprinkled on salads, or topped on a baked potato with broccoli. DASH isn’t just for people with high blood pressure. It’s an overall healthy, wholesome, high-fiber eating plan that can also help reduce cholesterol levels and aid in weight loss. Depression is a state of low mood and aversion to activity that can affect a person's thoughts, behavior, feelings and physical well-being. It may include feelings of sadness, anxiety, emptiness, hopelessness, worthlessness, guilt, irritability, or restlessness. Depressed people may lose interest in activities that once were pleasurable, or suffer cognitive impairments (e.g., difficulty concentrating, remembering details, making decisions). They may contemplate or attempt suicide. Their weight may change dramatically. Insomnia, excessive sleeping, change in sleep patterns (e.g., waking in the middle of the night or early in the morning and being unable to fall asleep again), fatigue, loss of energy, and aches, pains or digestive problems that are resistant to treatment may be present. It is important, if you suspect that you may be suffering from depression and/or are contemplating suicide or have suicidal thoughts to immediately seek medical attention. A stroke, previously known medically as a cerebrovascular accident (CVA), is the rapidly developing loss of brain function(s) due to disturbance in the blood supply to the brain. This can be due to ischemia (lack of blood flow) caused by blockage (thrombosis, arterial embolism), or a hemorrhage (leakage of blood). As a result, the affected area of the brain is unable to function, which might result in an inability to move one or more limbs on one side of the body, inability to understand or formulate speech, or an inability to see one side of the visual field. A stroke is a medical emergency and can cause permanent neurological damage, complications, and death. Risk factors for stroke include old age, hypertension (high blood pressure), previous stroke or transient ischemic attack (TIA), diabetes, high cholesterol, cigarette smoking and atrial fibrillation. High blood pressure is the most important modifiable risk factor of stroke. TIME: If you observe any of these signs, call 9-1-1 immediately. Treatment within 1-3 hours or less is critical. COPD (Chronic Obstructive Pulminary Disease) is also known as emphysema and chronic bronchitis, and it is a very serious disease. According to the American Lung Association, it is the third leading cause of death in the United States. COPD is often preventable and treatable. Stay inside on bad air days. Get a flu shot - Avoid being around people with colds or flu. 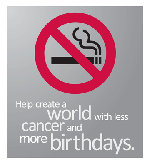 Visit the American Lung Association website for more information. Simplify your life and reduce stress! 1) What causes someone to be stressful? Feeling stressful is an indicator that the body's stress response has been activated producing adrenaline and other chemicals as a response to the fight or flight syndrone. The body reacts to a stressor, real or imagined, and if the stressor persists, it will find ways to cope developing cognitive, emotional, physical and behavorial symptoms. Long term stressful situations can weaken the immune system and bodily funtions start to become impaired, causing ulcers, depression, diabetes, digestive and cardiac problems and more. 2) How do you deal with the stress in your life? 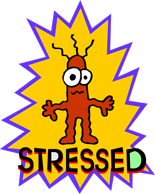 Everyone deals with stress in different ways and some common behavorial symptoms include eating more or less, procrastinating, using alcohol, cigarettes or drugs to relax, sleeping too much or too little, and developing nervous habits, like nail biting, pacing, and scratching. To help eleviate some of these symptoms or the degree to which they occur is to develop good habits like eating a balanced diet and exercise to help your body cope. 3) What can you do to reduce Stress? Any form of exercise will help reduce the symptoms of stress, including running, walking, exercise machines, weight lifting, biking, hiking, etc. Meditating, yoga, and Tai Chi are also helpful. Research shows that walking 10,000 steps a day is all it takes to reduce stress, improve health and reduce the risk of disease. With an inexpensive pedometer, it’s fun (and easy) to see how quickly your steps add up from simple changes like taking the stairs. 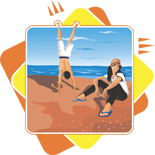 Click the EXERCISE tab at the top of the page to view information about the BMS Walking Challenge. Yoga is an ancient form of personal development utilizing mind, body and spirit. It can be a series of simple stretches, for the elderly and babies, to more involved stretching and the manipulating of arms and legs in different poses for those with more agile systems. The series of yoga poses work to safely stretch your muscles, releasing lactic acid that causes stiffness, tension and pain. Though not Yoga, Tai Chi is another ancient form of stretching and strengthening utilizing mind, body and spirit. Since yoga is a combination of physical and mental awareness, it has multiple benefits to your health. It strengthens your muscles, increases flexibility, helps with endurance, increases your awareness of your body symptoms and your surroundings, makes you aware of your posture, and as a form of exercise will help with diet and weight control, helps pain prevention, helps with stress reduction and mental calmness. Even someone just starting out performing beginning simple yoga movements will benefit greatly. Meditation is a mind-body relaxation technique used for relaxation and stress reduction. Meditating produces a deep state of relaxation and a tranquil mind. During meditation, you focus your attention on simple, tranquil thoughts and eliminate the negative, jumbled thoughts that may be crowding your mind and causing stress. Through practice, the meditation process produces an enhanced physical and emotional well-being. Spending just a few minutes in meditation can restore your calm and inner peace, reducing any anxious, tense and worried thoughts you have. Meditating is simple and inexpensive, it can be performed anywhere and it does not require any special equipment. You can practice meditation wherever you are — whether you're out for a walk, riding the bus, waiting at the doctor's office or even in the middle of a difficult business meeting. Click here for important tips to help manage stress. A refreshing, low fat dessert. 1) Place rice in sieve. Rinse under cold water, stirring with fingers to remove excess surface starch. Place in a 5-qt saucepan with water and salt, and bring to a boil over high heat. Reduce heat to medium and boil 7 minutes, or until tender. Drain rice; return to pot. 2) Stir milk and sugars into rice until sugars dissolve. Bring to a boil over medium-high heat. Reduce heat to medium-low to maintain a slow simmer. Stir frequently at first and constantly toward the end, for about 25 minutes, or until rice doubles in size, is very soft and tender, and milk has the consistency of heavy cream. 3) Pour into a bowl; stir in vanilla, orange zest and cardamom. Cover surface of pudding with plastic wrap to prevent a skin from forming. Let cool. Refrigerate until chilled, about 4 hours, before serving. Orange Rice Pudding Parfaits: For each parfait, spoon 1⁄4 cup orange rice pudding into a glass, then top with 3 orange sections, 1 Tbsp thawed reduced-calorie whipped topping and 1 tsp fat-free butterscotch caramel topping. Repeat layers..